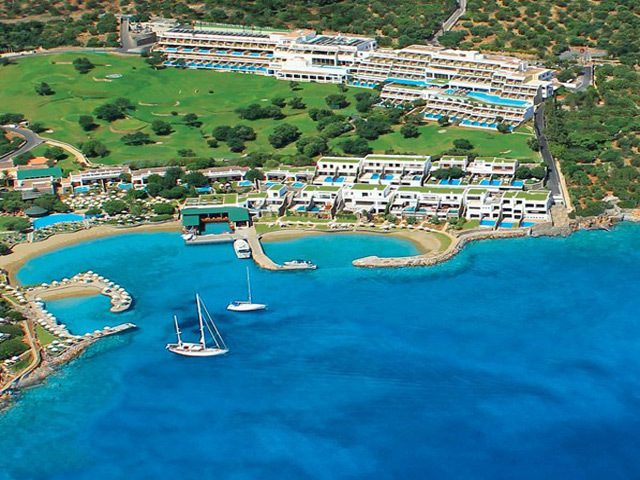 The Elounda Bay Palace is a picturesque Resort, with Cretan architecture set in lush, colorful gardens combining natural beauty with all the advantages of modern living. It is the ideal for those seeking a relaxing holiday. 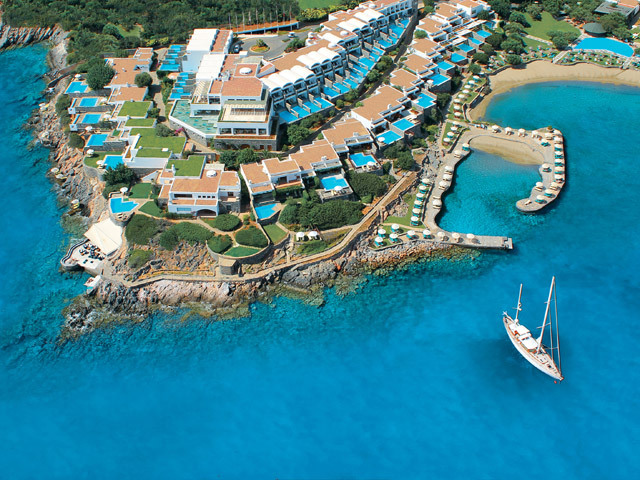 The Elounda Bay Palace is a member of the Associations, The Leading Hotels of the World and Concorde Hotels. A member of ‘The Leading Hotels of the World, there is something undeniably alluring about the Elounda Bay Palace Hotel. Set amidst 20 lush acres of landscaped gardens and overlooking the sparkling blue ocean of the Mediterranean Sea, it offers one of the world’s most exceptional locations. The Elounda Bay Palace is a picturesque resort, with Cretan architecture set in lush, colourful gardens combining natural beauty with all the advantages of contemporary living. Ideal for those seeking a relaxing holiday, it offers 244 rooms in total and features first-class service and unique accommodation. Superior Rooms Mountain View (26 m2) These refurbished rooms provide a real feeling of comfort, offering a wonderful mountain view. They are composed of one bedroom with a marble - lined bathroom and a private balcony. There is also the option of adding a single sofa bed. Upon request, families are provided with connecting accommodation in Superior Garden or Mountain View Rooms. Superior Rooms Side Sea View (26 m2) These stylishly furnished and nicely laid-out rooms offer a charming side view of the Cretan waters. They are composed of one bedroom with a twin or Queen sized platform bed, marble-lined bathroom and a private balcony. Upon request, families are provided with connecting accommodation in Superior Room Side Sea View. Superior Rooms Sea View (26 m2) Apart from providing a breathtaking view of the sea these rooms feature a marble-lined bathroom, a balcony, a twin or Queen sized bed, the sophisticatedly decorated rooms are located in both Main Buildings . Upon request, families are provided with connecting accommodation in Superior Sea View Rooms. Superior Bungalows Sea View (26 m2) These bungalows are composed of a bedroom with a Queen-size concrete platform bed, a comfortable marble-lined bathroom and a private veranda with a patio. 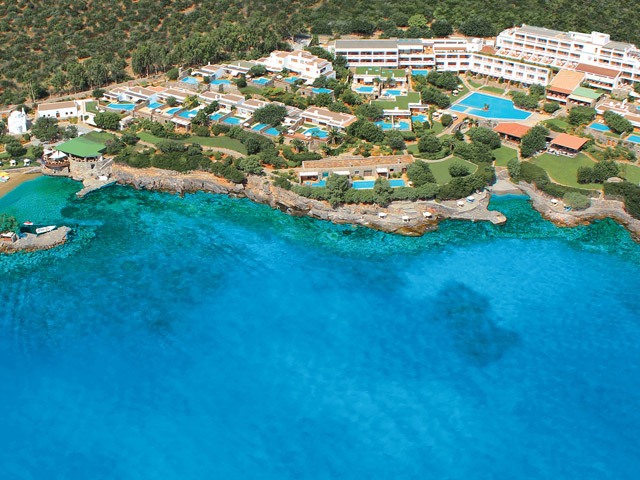 They are located around the resort, situated in the third and forth rows from the water’s edge and offering views of the Cretan waters. Superior Bungalows Sea View with use of a nearby Heated Pool (26 m2) These bungalows consist of a bedroom with a Queen-size bed concrete platform bed, marble-lined bathroom and a private balcony. They are situated on the third row from the water’s edge and stand in a row of seven bungalows. Their external corridor leads to the wonderfully relaxing grand heated swimming pool nearby. Deluxe Rooms Sea View (35 m2) Located in the Main Building, the Deluxe Room (35m) has been lovingly designed to provide Greek plush comfort and style. Offering a highly comforting style, these are composed of one bedroom with either Twin or Queen- sized beds, a marble-lined bathroom and a private balcony with vistas of the sea. Deluxe Hotel Suites with Sea View (60 m²). This exceptional space offers a complete feeling of comfort and style and is composed of one bedroom with separate or open plan living room, spacious enough to accommodate an extra person. Suites include one or two en-suite luxury bathrooms with a TV, Jacuzzi bathtub, separate shower cabin, some of which have a steam bath feature and gym facilities. 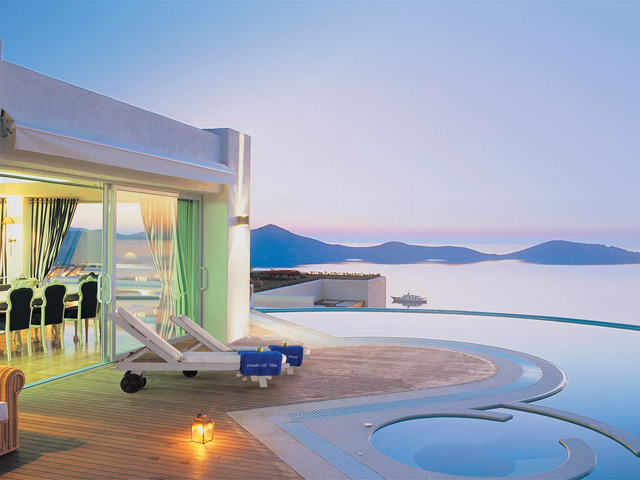 The comfort of the suites pours onto an exquisite private balcony and offers majestic, view of Mirabello Bay. Special features include a CD system, VCR or DVD. Executive Bungalow Suites Side Sea View (60 m2) These bungalows have it all – the verdant gardens they are surrounded by, the nearby swimming pool and a view of the sea. With an emphasis on sheer comfort throughout, they are composed of a bedroom with a Queen-sized bed, a separate living room and two bathrooms (a large modern bathroom with Jacuzzi bathtub and individual shower cubicle, and a WC with a shower). Some Executive Bungalows also feature a kitchenette to facilitate your daily needs. The graceful veranda has a private patio, perfect for entertaining friends or relaxing with a real and exclusive sense of space. Special features include CD system, large screen TV with VCR and TV in bathroom. Family Suites Garden View with shared Heated Pool (38 m2) Space, a convenient layout, luxury facilities and an enticing view that brings nature to your private lodgings are only some of the attributes of this accommodation. The suite is composed of a generously sized bedroom with a King-sized bed, and includes a single sofa bed, an elegant open-plan living room, a large, modern bathroom with a TV (some suites have two bathrooms), as well as a WC with a shower. You can also enjoy relaxing on your terrace or having a swim in the shared heated pool. Special features include CD system and DVD Superior Bungalows Front Sea View with shared Heated Pool (30 m2) The view alone from these bungalows is a beautiful breath of fresh air. But there’s more; the airy bedroom with a streamlined decor has a Queen-sized bed and a lavish, marble-lined bathroom. The bungalow pours out onto a restful private terrace overlooking the swimming pool (shared by seven bungalows) and the splendid waters of the Mediterranean Sea. Special features include CD system and DVD. Luxury Suites Front Sea View with shared Heated Pool (50 m2) Innovative in their use of space, light and colour, these suites (50m) are created with a harmonious balance of contemporary design influences. Set on the first row from the waters- edge and offering a view of the sea, this luxury accommodation is composed of a large bedroom with a Queen-size bed, an open plan living room and a spacious bathroom with a wonderful skylight feature, Jacuzzi bathtub, TV, separate shower cabin and steam bath. The private veranda leads directly to a heated pool, shared by four Suites. Special features include CD system, large screen TV, DVD. Upon request Families are provided with connecting accommodation in Luxury Suites. Junior Bungalow Suites Waterfront shared Heated Pool (65 m2) Designed exclusively to provide the ultimate in personal comfort, these suites (65m) provide a perfect equilibrium between luxury and homely familiarity. Set on the first row from the water’s edge and offering a panoramic view of the dazzling Mirabello bay, they consist of one bedroom with a queen-size bed, an elegant living room and a spacious marbled-lined bathroom with a Jacuzzi bathtub, TV, separate shower cabin and steam bath, as well as a WC with a shower. The veranda leads directly to a soothing heated pool, shared with the next-door bungalow. Special features include large screen TV with DVD, CD system. Mediterranean Villas with Private Heated Pool on Seafront (65 m2) Directly overlooking the sea and situated right above its crystal waters, these villas (65m) are guaranteed to soothe away all stress and leave you feeling calm and rejuvenated. They are composed of a gracefully furnished bedroom with a separate living room stylishly decorated in warm and calming Mediterranean tones. The bathroom offers a real sense of space and relaxation, with a Jacuzzi bathtub, TV and separate shower cabin. The Villa has a large veranda perfect for relaxing alone or with friends, and offers exclusive access to a private heated whirlpool. Special features include CD system, large screen TV with DVD and facsimile. EXCLUSIVE CLUB 1 Penthouse Suite with Panoramic Sea View, 3 bedrooms, 4 bathrooms & kitchen 1 Presidential Suite with Private Heated Pool on Water’s Edge 1 Grand Suite with Private Heated Pool on Water’s Edge 1 Palace Suite with Panoramic Sea View, Private Heated Pool and Gym Room The Penthouse Suite with Panoramic Sea View (250 m2) Experience sheer luxury and the joy of sumptuous decor in this stately residence (250m), which is composed of no less than three bedrooms, a lavishly furnished open plan living and dining room area and a fully equipped kitchen to suit your every need. Enjoy the ease and elegance of the three marble-lined bathrooms with a Jacuzzi and steam bath, and the additional guest WC. Providing a fantastic level of comfort, the Suite is located on the fourth floor of the main building and offers majestic, sweeping views of Mirabello Bay from its spacious terrace and balconies. Special features include a Bang & Olufsen CD Hi-Fi system, PC, printer and direct LAN Internet access, Sony Plasma TV, TV in bathrooms, a TV with DVD and facsimile. The Presidential Suite with Private Heated Pool on Water’s Edge (100 m2) Decorously living up to its name, the two-floored Presidential Suite (100m) is built in the architectural style of a maisonette and stands directly over the water’s edge, offering extensive views of Mirabello Bay that can only inspire a deep sense of calm. On the ground floor it is composed of a sumptuously designed living and dining room area, while on the upper floor there is a very spacious bedroom that has been sophisticatedly decorated in soothing Mediterranean tones. On the ground floor, the Presidential Suite includes a separate walk-in dressing room and plush marble-lined bathroom, while on the upper floor you can enjoy a large double vanity marble-lined bathroom with a steam bath and Jacuzzi bathtub. For your hours of private rest and recreation, the Suite has a wooden veranda with a charming private patio on the ground floor and balcony on the upper floor. Special features include a CD system, TV in bathroom, facsimile and digital stereo, large screen TV with DVD and headphones. The Grand Suite with Private Heated Pool on Water’s Edge (135 m2) Two splendid villas stand over the water’s edge – and both of them are yours. This exquisite suite (135m) is comprised of two architectural gems, one of which is composed of a bedroom, a spacious separate living room and a bathroom with a Jacuzzi bathtub. The second villa is composed of a bedroom, an open plan living room, a dressing room and a luxurious bathroom with a steam bath and separate shower cabin. Stepping out onto a large veranda from either villa, facing a mesmerizing panoramic view of Mirabello Bay, you will find yourself in a lush garden with a private heated whirlpool designed for your delight. Special features include TV in bathrooms, CD system, facsimile, digital large screen TV with DVD and headphones and PC, printer and direct LAN Internet access. The Palace Suite with Private Heated Pool Sea View (250 m2) Elounda Bay offers you your own private palace, situated on the second row from the water’s edge and offering majestic panoramic views of Mirabello Bay. This eminent suite (250m) is composed of a fabulously lavish living room with a chic dining area, a fully equipped kitchen to suit your every need, two sumptuously comfortable bedrooms, an excellent private gym room and two luxurious marble-lined bathrooms, one of which has a Jacuzzi bathtub, steam bath and shower cabin. The grandiose terraces lead to a perfectly soothing private heated swimming whirlpool and a blossoming private garden, where you can relax profoundly while enjoying the stunning panoramic views of Mirabello Bay. Special features include TV in bathrooms, Bang & Olufsen CD Hi Fi system, facsimile, digital large-screen Satellite TV with DVD and headphones, PC, printer and direct LAN Internet access. Kindly note that certain Recreational/Leisure facilities and Guest Services are offered at a relevant cost. The newly opened "Crete Golf Club"is located only 40 km from the elounda Beach and has 18 holes, built in an exciting desert style desigh. The course offers dramatic views and truly tests every aspect of the golfer's repertoire. Thalassa Waterfront Restaurant This glamorous restaurant is known and loved for its flavorsome fish menu and gourmet seafood delicacies. Dining at Thalassa is a romantic and relaxing experience, as the restaurant is set right by the water’s edge overlooking the lit up bay, and gentle live music regularly accompanies pleasurable evening meals. F’ Restaurant Explore the tantalizing inventiveness of Mediterranean cuisine at ‘F’ restaurant, which has designed a discerning and distinguished menu that complements all tastes. Located right by the water’s edge, both the romantic sea view and the ingeniously intricate flavors drift you away to the most splendid parts of the Mediterranean. Ariadne Taverna Elounda Bay Palace offers you the classic seaside taverna through Ariadne; just what you need when you step right off the beach in search of a light a la carte lunch of grilled fish, meats, fresh delicious salads and other undemanding yet appetizing regional dishes. Evening menu includes a variety of Italian dishes, including delicious pizzas. Aretoussa Restaurant The chefs of Aretoussa specialize in carrying on the most beloved traditions of Greek and international cuisine. The restaurant faces out onto a striking panoramic view of the bay, making it the perfect place to relax and sample dishes selected from a richly varied menu. Blue Lagoon Polynesian Restaurant & Sushi Bar A chic, glittering atmosphere and delectable, authentic Polynesian tastes. Experiment with a plethora of the most refined and exotic flavours, which have captured the hearts of connoisseurs from around the world. Blue Lagoon, a gateway to the flavors and tastes of the Far East, proposes a plush treat for the senses and another excellent option for elegant dining. Its acclaimed sushi bar is of the highest standard, providing classic and internationally adored sushi cuisine as well as its own very original – and vibrantly memorable to the palate – renditions created by our uniquely charismatic chef Argonaut Seaside Restaurant At Argonaut you will discover top-standard healthy and enticing Mediterranean snacks during lunch hours, whilst in the evening the sea-facing restaurant lures you with its splendid variety of fragrant Italian dishes, designed by our experienced chefs. Dionyssos Gourmet Restaurant Named after the hedonistic God of Wine, Dionyssos pleasingly lives up to the promise of indulging all your senses with its superb gourmet cuisine. The outstanding restaurant offers a superb blend of classical Greek gastronomy with contemporary influences, served in an understated yet highly exclusive atmosphere. Kafenion Greek Restaurant Here you can sample the nutritious delights of the world-renown Cretan cuisine. Pure, simple homemade-style delights are served in the quaint and laid-back setting of a traditional Greek village square, refreshingly shaded by olive trees and only a stone’s throw away from the beach. Sail-in Beach Bar Set sail with a breezy refreshment, light lunch or snack at a bar comfortably located beside the beach. Three giant sails crowning the bar set it apart, as does its tranquil beach atmosphere and deck-like wooden floor. Sail-in welcomes you throughout the day. Erato Lounge Bar Relish in pronounced leisure at this elegant bar, while enjoying your afternoon coffee or meeting with friends for a pre-dinner aperitif. Erato welcomes you until the early hours for laid-back enjoyment. Poseidon Pool Bar Step out of the pool and bright sunshine and take a break for a delicious light snack or fresh fruit juice under the refreshing shade of a tree at the casual Poseidon bar. Veghera Jetty Bar The sparkling waters impressively encircle this lively and glamorous bar, which is like an island on its own. Refreshing cocktails, excellently prepared by our friendly, cheerful staff, flow perfectly along the waves of revitalizing and atmospheric music. Veghera is the ideal place to enjoy a drink at sunset, when the surrounding sea and sky blaze with colors, after dinner, when the bay gleams with glittering lights, and even until the early hours.